Evolution of user interface and user experience technologies from browsers and search engines to smartphones delivering a richer and more personalized user experience. Progression in consumer experience marked by user interactions that have evolved and co-mingled with storefront, catalog, agent, and online self-service channels. We incorporated chatbots into our product strategy to improve operational efficiency in health system access centers through administrative process automation. Our chatbot integration automates the task of finding clinically appropriate providers and manages bookings, taking into account health system business rules and patient preferences. We maintain comprehensive information about providers such as contact information and location and share that information with patients when they interact with the chatbot. The chatbot channel is integrated into our clients digital experience. The chatbot shifts demand from access center agents for automatable tasks around provider matching and booking to the chatbot self-service channel. 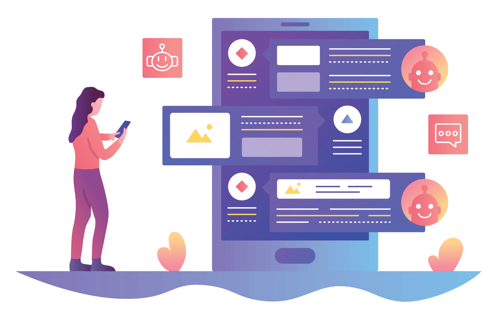 You can realize the promise of a delightful user experience by adopting the Conversational User Experience framework which consists of the following key components – mission, personality, prioritized list of capabilities, and conversation flow. Mission: Your chatbot must have a mission that directly relates to your business value proposition. Articulating the mission will bring clarity to the capabilities that your chatbot must support. The mission of Kyruus chatbot is to delight patients by helping them identify the right provider and facilitate booking an appointment. Personality: Your chatbot represents your brand and therefore an investment in defining its persona and how it will interact with users is critical. Ideally, the chatbot offering extends or complements your products or solutions, while engaging the user and providing a personalized experience. Our chatbot’s personality, interactions, and responses are designed to fulfill patient need and build trust with users. The characteristics we model in the chatbot when interacting with users are being polite, respectful, formal, proactive, and diligent with the central theme of enabling seamless access to care for patients. Prioritized List of Capabilities: Designing a chatbot is very similar to developing a product capability. You want to define elements of your MVP, v1, and offering roadmap. We have found that prioritizing the capabilities along the dimensions of intent identification, fulfillment, display design, session history, and performance, yields a successful MVP with a good return on investment of time and effort. Conversation Flow: The final and significant part in the conversational user experience design framework is the conversation flow design. Human conversation is a series of dialogues where there’s a back and forth in figuring out intents and responding with suitable answers till the interaction reaches a natural conclusion. A high-quality interaction with a chatbot is one that simulates human dialog. There are four phases in the flow design— Welcome or Greeting Phase, Intent/Task Discovery Phase, Task Resolution Phase, and Session Conclusion Phase. The Intent/Task Discovery Phase is the most critical and important phase of the flow as this is where the intent takes place. The user task is resolved and chatbot ends the session after confirming the user has no further tasks. By using the Conversational User Experience framework, you’ll be able to deliver a rich, personalized, and self-service experience for your users. Check out the first two blogs in the series to learn how your organization can leverage chatbots to meet consumer expectations and the guiding principles to follow for chatbot integration.